While there are variances from species to species, there are typically three castes within a termite colony that work together to ensure the survival of the colony. Here is a little more information on the termite caste system. The termite caste system is divided into reproductives – the king and queen, soldiers, and workers. Each play their own special part in the survival of the colony. Queen termites are key to founding and growing of termite colonies because colonies are created when a potential queen termite joins a mating swarm. The termite queen is responsible for increasing the population of the colony. 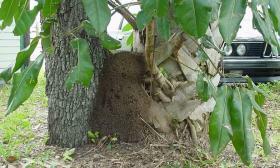 The mating swarm is comprised of male and female reproductives from already established termite colonies. These reproductive termites have wings, allowing them to move away from the established colony. Many species’ reproductives are dark in color. The swarmers land and shed their wings after the mating process. While reproductive termites look very similar to winged ants, both males and female reproductive termites survive beyond the mating swarm, whereas male winged ants die after the mating process. The male and female reproductive termites go on to found colonies, becoming kings and queens of their new colonies. Soldier termites are responsible for the protection of their colony, known to sacrifice themselves for the benefit of the rest. Soldier termites have enlarged mandibles. They use their mandibles to defend their colonies against predators and other threats such as ants and other termite colonies. When the colony is assaulted the soldier termites sacrifice themselves by remaining outside the infiltrated colony while worker termites repair any damage. But because they mandibles are so enlarged, the soldier termite is incapable of feeding itself. Worker termites are pale in color and are blind and their responsibility is to feed other termite castes.